To nominate someone complete the form here. 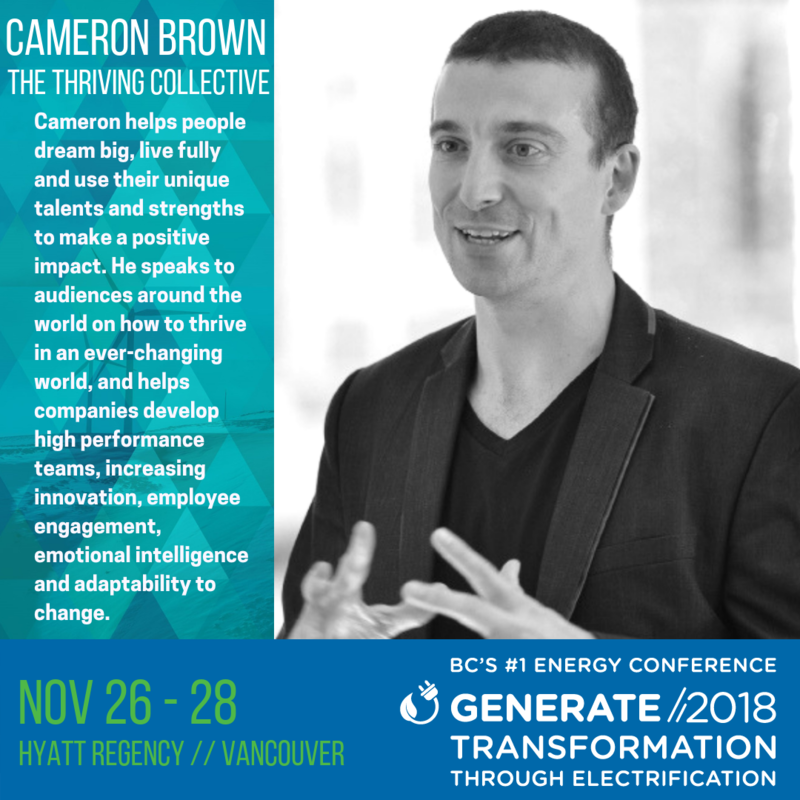 We are happy to announce Cameron Brown as one of Generate 2018’s keynote speakers. As founder of The Thriving Collective, Cameron helps people dream big, live fully and use their unique talents and strengths to make a positive impact. He speaks to audiences around the world on how to thrive in an ever-changing world, and helps companies develop high performance teams, increasing innovation, employee engagement, emotional intelligence and adaptability to change. Cameron’s talk is sure to be empowering, inspiring and thought provoking. Attend the conference to join this and many other exciting conversations! Emceed by James Glave, it’s an entertaining, inspiring and fast-paced clean energy “game show” where the audience picks the winner! We’ll invite contestants to pitch conference attendees their most inspired ideas on how best to increase awareness, deployment and performance of clean energy generation in BC. Do you have a Big Idea you’d like to share at Generate 2018? Or do you know someone who does? Clean Energy BC relies on our generous sponsors to host the Generate conference, our largest annual event. Sponsorship is a great way to support the sector, while gaining visibility for your organization’s services, products and projects. — Adam Lewis, President, Ecofish Research Ltd. Contact Lisa today to learn more about how you can support Generate 2018 through sponsorship or visit us here. When Premier John Horgan gave his ministers their mandate letters, essentially their “to-do lists,” it was clear that finding innovative ways to decrease GHGs was a priority for the NDP government. And they’re working hard to make progress toward this vital goal. Developing a new Energy Roadmap. The Climate Solutions and Clean Growth Advisory Council. Establishing strong GHG reduction targets. A commitment to the world’s cleanest LNG. More clean-tech university training. These actions make a real difference. But, despite these initiatives, there is more we need to do to ensure B.C. doesn’t fall behind. On those ministerial lists was something that, counter intuitively, means we can use more energy and still help the environment. Through electrification — using electricity instead of other energy sources — we can keep our standard of living and create more jobs and revenue while reducing the impacts of climate change, both at home and abroad. The great thing about electrification is it keeps the economy flowing strong and ensures we maintain our role as a climate and clean-energy powerhouse. We have a wealth of successful, cost-effective renewable power being produced in B.C. daily. In fact, did you know that 14 per cent of the electricity in B.C. comes from wind, small hydro and solar producers? The government recognizes we need to do more to keep us in front of this critical environmental, economic and social opportunity. Luckily, we have a tool to do that: the B.C. Clean Energy Act gives us a chance to embrace our strength in renewable-energy production over time. We can add even more affordable B.C. clean electricity to the grid and help other industries, which rely on dirtier sources like petroleum, to green up. Mining is just one industry that has seen the benefits of sustainability through the electrification of their operations. Electrification also does something else that aligns well with this government’s goals: It helps foster the development of First Nation and rural communities through the use and development of renewable resources. Our association has also proposed a new Electric Truck mandate — a chance to make significant gains and keep us in front is greening transportation and reducing its GHGs. By switching only five to 10 per cent of trucks to electricity by 2025 the NDP could send a strong signal about its seriousness in achieving our climate-action goals. We applaud the vision of this NDP government and its work to fight climate change. And we look forward to a future when our members help drive us toward electrification and a competitive economy that delivers more value to families across B.C. These are things we are going to be talking about at our Global Electrification Now! Summit on June 14. It’s time to hit the pedal and make sure we aren’t left behind on electrification. Jae Mather is executive director of Clean Energy B.C. Climate change is disruptive. We can all agree on that. But there is a path forward where we can rise above the disruptions: electrification. It’s the best way to bridge the gap to meet our greenhouse gas (GHG) reduction goals. The B.C. government has committed to a 40 per cent reduction in GHG emissions by 2030 (based upon 2007 levels) – something that benefits us all. This sets a clear goal for what success looks like for B.C. It’s an ambitious target but it demonstrates a government that understands that the opportunities for B.C.’s economy, resilience, innovation and employment are tremendous. Alternatively, failure to mitigate against climate change would cost our economy far more than any industry can generate. B.C.’s brand is “supernatural” and associated with a clean, green environment. Our electricity is among the greenest in the world and at one of the lowest costs anywhere. This has blessed B.C. with one of the biggest tools available in the carbon reduction box. Using B.C. clean energy, with our abundance of existing hydro dams, run of river hydro, wind, solar and biomass (not to mention the immense potential for geothermal, batteries, and wave & tidal power) gives us a phenomenal competitive advantage by helping us create some of the lowest carbon products and services in the international marketplace. Dramatically cheaper renewable energy technologies are already competitive and this trend is only going to continue. Working in partnership with First Nations and local communities, the expansion of our electricity generation systems throughout the province builds resilience, reconciliation and local economic empowerment. We’re already producing the lowest carbon aluminum and every cup of coffee made in B.C. with our clean electricity is ultra-low carbon. As B.C. designs our climate change strategy and the energy roadmap comes together, electrification will be a central part of it. Simply put, this means using much more electricity instead of other energy sources. It reduces our exposure to the risks associated with climate change, both environmental and economic. It continues the process of diversifying our economy and helps to insulate us from the volatility and disruption that is already becoming increasingly common. It enables us to capitalize on the vast resources that are being focused on climate solutions and it sends the signals to the investors, manufacturers, suppliers and the educators from the clean technology sector. And it creates the fertile environment that opens the door for investment on innovation to be applied in an environment where the clear goals are laid out for the future of a low carbon B.C. But how do we take advantage of this pathway? In order to meet our GHG targets through electrification there is a need to significantly increase the amount of renewable energy being generated in B.C. by more than 5 GW of peak power. This is equivalent to adding more than 25 per cent of additional power generation to B.C. by 2030! In addition to BC Hydro heritage assets, BC already has over 120 small hydro, wind, solar, biogas and biomass projects that are providing clean, low-cost electricity to British Columbians in partnership with First Nations. These clean energy companies are at the forefront of the fight against climate change and have the expertise needed to lead the electrification transition. Fossil fuels and their place in this transition. And what about fossil fuels? Let’s use them for the highest and best applications. Suppliers can then shift the focus to exporting the lowest GHG fossil fuels to the rest of the world, an attractive product. Electrification can reduce GHGs in one of our most important resource sectors: natural gas. B.C. is in an enviable position when it comes to natural gas and LNG. We have remarkable reserves, and because of our clean electricity grid, we have an almost unique capacity to electrify the processing of our natural gas, LNG and distribution. With full electrification, B.C. natural gas and LNG products would be amongst the lowest life cycle carbon emission fossil fuels in the world. By 2050 the world will have transitioned towards an 80 per cent carbon reduction. Therefore in the medium term (20-40 years) carbon-constrained future, it is only the highest quality, lowest GHG fossil fuels that will still have a share of the market. For those that want to see the natural gas industry not only survive but to thrive, clean energy is the solution in this transformational time. It gives investors the confidence to keep their money in the sector and it gives B.C. the capability to add value and securing the jobs and economic benefits that are so vital. Natural gas and LNG’s future is inextricably linked to clean energy. Where are we now and how can electrification help? Electrification is the biggest tool in the toolbox when it comes to bridging that gap and meeting that need. Clean technology is the fastest growing sector in the world and it sits at the core of the electrification process. In 2007 B.C.’s total carbon (equivalent) emissions were 64.66 million Tonnes (Mt). Our 2030 target is 38.8 million Tonnes, which is a 40 per cent reduction. Currently our emissions are 61.6 million Tonnes – we need to find another 22.8 million Tonnes (37 per cent) of reduction over the next 12 years. Total reduction = 22.97 Mt which equates to a 40 per cent reduction from 2007 levels. We can do this by reducing GHGs by 39 per cent in transportation: electric vehicles, hybrids, plug in hybrids, bio-fuels, hydrogen internal combustion, fuel cells, renewable fuels etc. We can improve our built environment, for another 17 per cent reduction: electrification of heating such as air source heat pumps reduce the emissions by 97 per cent over gas and a geoexchange system reduces emissions by 99 per cent. And industry has a big role, where we can reduce emissions by 41 per cent. This is already starting to happen. Electrifying the natural gas industry reduces GHGs by over 90 per cent! And the Mining Association of BC is committed to taking advantage of our electricity resource by moving forward on delivering the lowest carbon minerals in the world. So, remember, the path may be challenging but it is there for us to either follow, or for us to lead. Electrification is our way to a decarbonized future, which is why Clean Energy BC is hosting our first ever Global Electrification Now = Low Carbon Future Summit in Vancouver on June 14th, 2018. To take part in this transition visit Clean Energy BC for more information about the Summit.